Gallia Academy senior goalkeeper Pierce Wilcoxon kicks the ball away during the Blue Devils’ soccer match against Belpre on Oct. 10 in Centenary, Ohio. PROCTORVILLE, Ohio — This time, there had to be a winner — but unfortunately for the Blue Devils, it wasn’t them. 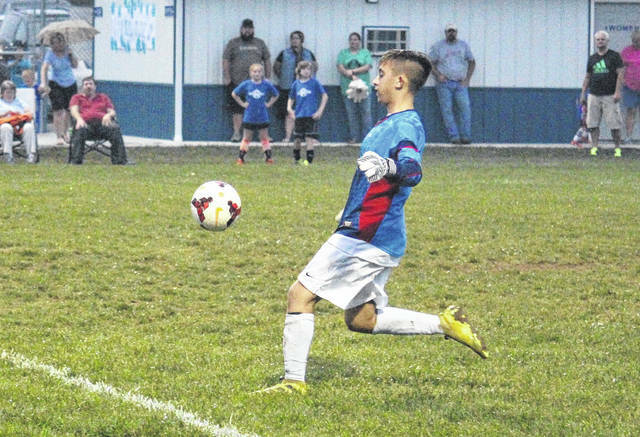 After playing to a pair of Ohio Valley Conference draws during the regular season, the Gallia Academy High School soccer squad fell to the host Fairland Dragons 2-0 on Monday in a Division II sectional tournament tilt. The Dragons, the eighth-seeded squad in the sectional, scored a goal in each half to down the ninth-seeded Blue Devils, whom they tied 2-2 in the season opener before a 1-1 tie a month later. For Fairland, Lane Jordan scored both of the club’s goals —the first coming with 24 minutes remaining in the opening half, before the critical second marker with only 13:45 to play. Gallia Academy actually outshot the Dragons 9-4, including four on goal, but Ben Ward — the Dragon goalkeeper — was up to the task in getting a clean sheet to end the Blue Devils’ season. The loss snaps a two-year streak of GAHS winning a sectional championship — the only two sectional titles in the soccer program’s history. Gallia Academy — a young team this season — ended its year at 1-12-4, as it was outscored in those dozen setbacks by a whopping count of 60-7. The Blue and White was also shut out seven times this year. In the OVC matchups against GAHS, the Dragons had managed a playback own goal, a penalty kick and a free kick for their three markers. But this time, Jordan got goals on both of his shot attempts, as Trenton Baumgard and Clayton Bloss took first-half shots for Fairland — which were both saved by Blue Devil goalkeeper Pierce Wilcoxon. Ward stopped four shots for the Dragons, as Andrew Toler took two while Seth Flinner and Justin Day attempted one. Toler attempted three total shots and Day two, while Flinner, Tristan Posley, Tristan Eggers and Obie Reeves recorded one shot apiece. The match marked the final for three Gallia Academy seniors —Wilcoxon, Eggers and Reeves.